Happy Holidays to everyone! And many thanks to the Hoydens for hosting me again. I recently traveled to London and, as always, brought home a few treasures. 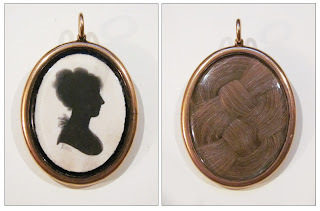 This time I added new pieces to my collection of Georgian painted silhouettes, specifically silhouette jewelry, and I am going to share these pieces with you today. You can read more about painted silhouettes on mywebsite, but let me briefly explain what they are. Rather than silhouettes cut from black paper, the silhouettes I collect are painted. You still get the profile of the sitter, but painting allows for more detail in the hair and clothing. Silhouettes, which were called profile miniatures or shades, were painted on paper, plaster, and ivory, and reverse-painted on glass. 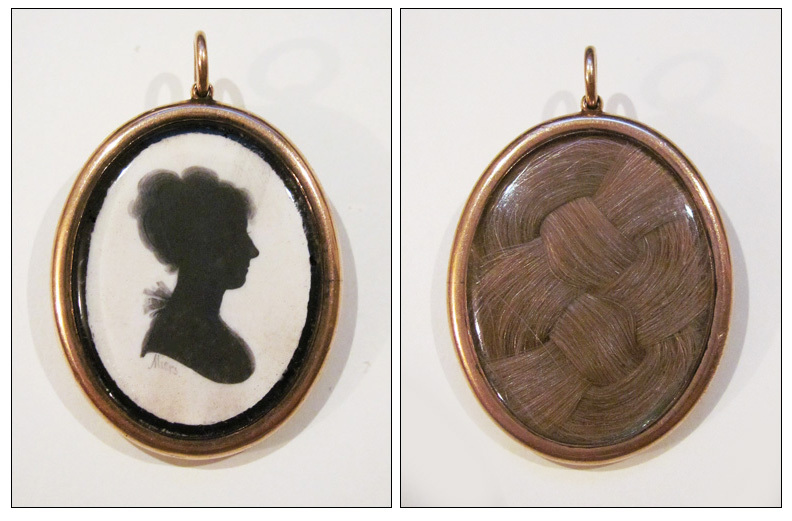 The pieces I am featuring today are all painted on ivory, which was the most common medium for jewelry. The black pigment used was generally made of lamp black mixed with beer, though fine details were sometimes done with India ink. Bronzing – the technique of adding details in gold against the black – was done using either gold or bronze powder mixed with gum arabic. Profile artists, or profilists, offered a cheaper and faster alternative to the fully painted portrait miniature, which was hugely popular during Georgian times. The sitter's profile was typically traced using a pentagraph or other mechanism, which took only a few minutes. The sitter need not be present for the profilist to finish the work, painting in the profile and adding hair and fashion details. The original profile could be saved and used again. For example, if the original commission was for a single framed profile miniature, the sitter or his family might later want more copies, or perhaps smaller versions set into jewelry. The pentagraph could reduce the profile to any size. The most famous profilist of the Georgian period was John Miers, who worked from the early 1780s until his death in 1821. He worked strictly in black, ie no bronzing or colored details, and his delicate rendering of ruffles and lace and other fashion details is extraordinary. His most famous protégé was John Field, who came to work in Miers' studio on the Strand in 1800 and stayed until Miers death, after which he set up his own studio. Field is best known for his bronzing details, which are extremely fine. All of the pieces shown here are either signed by or attributed to John Field during his tenure in the Miers studio, ie from 1800 to 1820. As you look at these images, remember they are VERY small, so all the details of hair and clothing, and even eyelashes, are teeny-tiny. This first piece, shown above, is a locket set in gold with a lovely braid of hair (presumably from the sitter) surrounding the profile. 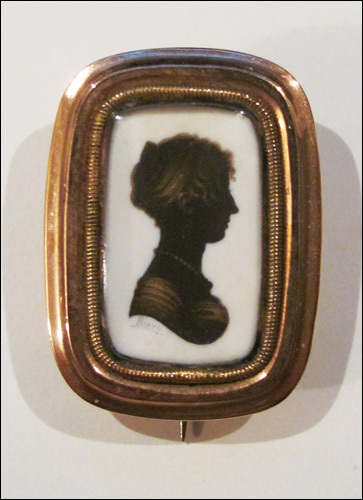 The profile, painted on ivory, is signed "Miers" in Field's hand. The lack of bronzing places is early in Field's career, probably before 1810. It measures 1" x ¾". I especially love the rendering of the neck ruff. The addition of the braided hair marks this as a sentimental piece, but whether it was a love token or a mourning token is not clear. The second piece is also a locket set in gold, though much larger at 1¾" x 1¼". The reverse is encased in glass, which would have held a lock of hair, though none is present. It is painted on ivory, and though unsigned, is attributed to Field. 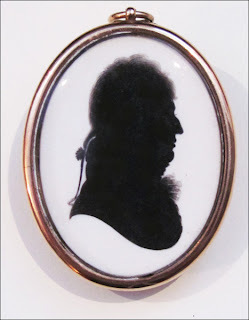 The interesting thing about this silhouette is that it came with a tiny handwritten note stuck to the back that says, "Robert Lowrie, killed in Peninsular War." A bit of googling led me to Captain Robert Lowrie of the 91st Foot. He died on Oct 3, 1813 from a wound suffered in the Battle of the Pyrenees on July 28. He was 36. A tablet was erected to his memory in St. Martin's Church, Lincoln (where he was born), by his brother officers as a mark of their esteem. Field's skill, learned from Miers, is particularly evident in the shirt ruffle. The third piece is a small brooch set in gold, measuring 7/8" x 5/8". Painted on ivory and signed "Miers" in Field's hand, it shows his skill at bronzing, picking out details of hair, jewelry, and dress. Whenever bronzing was used, the face was always left in solid black, though ears, as here, or a man's whiskers might be bronzed. Doesn't this one look like a perfect Regency Miss? The fourth piece is another brooch, even smaller at ¾" x ½". Painted on ivory and set in an octagonal gold frame, this profile is again signed "Miers" in Field's hand, and is likely another early piece. Once again, the neck ruffle is wonderfully painted, especially considered the size. The last of my new pieces is another locket, measuring 1¼" x 1". 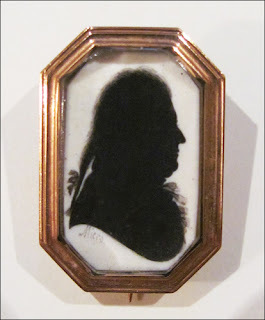 Painted on ivory and signed "Miers" in Field's hand, the profile is edged in black inside the gold frame. This marks it as a mourning piece. 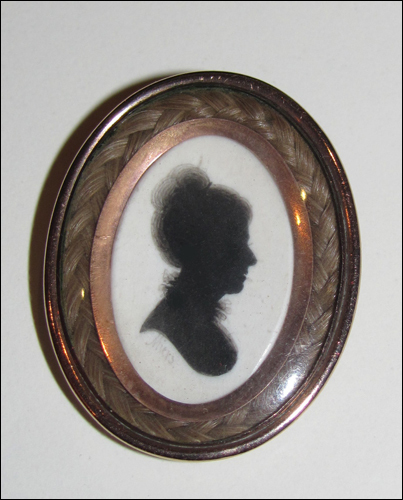 The glass case on the reverse is completely filled with braided hair, presumably from the sitter. Silhouettes were very popular as mourning jewelry as they could be copied and sent to friends and family of the deceased – a much more personal memento than a mourning ring. I have been collecting silhouettes for years as I find them more haunting than fully painted portrait miniatures. And I am amazed at the level of detail that can be attained in simple black. I got started collecting years ago when I fell in love with a lot of about 6 silhouettes at an auction in San Francisco, and luckily placed the winning bid. As it happens, all the silhouettes shown here were also purchased at auction, this time in London. Collecting is a terrible addiction! Thanks for visiting us Candice! What a fascinating post. It makes me realize I should use silhouettes more in my books. I love these miniatures. They bring home the fact that in these time periods, where we place fictitious heroes and heroines, there were real people, each one of them a book we'll never read, but beloved by their friends and families. Thanks, Candice. Fasincating post. I have never heard of painted silhouettes before. Thanks for doing all that research and sharing it and the recent additions to your collection. Absolutely amazing. A whole world of romance is encompassed in these beautiful creations. The entire process is fascinating. Thank you for sharing it with us. Thanks, everyone! Glad you enjoy the silhouettes. That's so cool! I've never seen these before. I have a question though--if they're done as mourning jewelry, how is the silhouette taken? You say they were usually "traced," so were these sihouettists constantly dealing with dead bodies? Rose, they would have used existing profiles for mourning pieces. Most profilists kept copies of all profiles he'd done. In fact, John Miers' labels state: "He keeps the original Shades, and can supply those he has once taken with any number of Copies. Those who have Shades by them may have them reduced to any Size, and dress'd in the present taste." It is reported that upon Miers' death in 1821, he had over 100,000 duplicates of profiles made in his studio, filed in books. So, a family could go back to the artist and have him use the profile "on file" of the now-deceased sitter to create mourning pieces. These are amazing! Thanks so much for sharing them with us (I want to make some soooooooooooooo bad!). These are fascinating, especially when you consider their size. Whatever happened to the books of duplicates that Miers had? Are they in a museum or did they disappear? If they are still around and accessible, is anyone making profiles from the old shades? Yes, the small size of these pieces makes the level of detail pretty darned impressive. Some of them are smaller than a postage stamp. Jane, I have tried without success to discover what happened to Miers' books of profiles. They might still be in possession of his family, as one of his sons continued the business after his father's death. Do you think perhaps Georgette Heyer was referencing such books in the title THESE OLD SHADES? Ohhhh. That makes way more sense...although it's way less of an awesome plot for a Gothic!